A surprisingly rich vegetable dish here, considering the relatively restrained ingredients. Perhaps it is down to the remarkable capacity that the aubergine has to soak up oil while being cooked – no bad thing, in this case. This remains one of the nicest sweet/sour dishes I know. 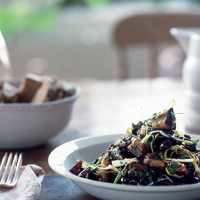 Sprinkle the aubergine with salt, then, using your hands, mix together in a colander. Leave to drain for 45 minutes to 1 hour, then rinse in a sink of cold water. Drain, tip onto some kitchen paper and carefully pat dry. Heat the vegetable oil in a non-stick frying pan until smoking and fry the aubergine briskly for about 10 minutes, until well coloured. Lift out onto a double layer of kitchen towel to drain. Pour the sesame oil, vinegar, ginger syrup and soy sauce into the pan; allow to bubble, then put the aubergines back in. Cook gently, stirring carefully, for 5 minutes. Add the salad onion, ginger, chilli and coriander. Cook for another 2 minutes, then allow to cool a little in a dish before serving. The Corker recommends- Californian Pinot Gris has the roundness and upholstery to cope with this dish’s Asian excitements.